Bernard Julius Otto Kuehn (1895-Unknown) and his wife were German-born spies for the Japanese government. They provided the Japanese with intelligence related to the attack on Pearl Harbor, Hawaii on December 7, 1941. After serving a long prison sentence, Kuehn and his family were deported to Germany. 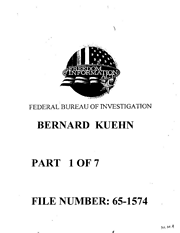 For more information, see: http://www.fbi.gov/news/stories/2005/february/kuehn_022105.